Moon Valley 5 Bedroom Homes For Sale July 2018. Moon Valley in North Phoenix is a quaint community nestled between 3 mountains: Moon, Lookout and Shaw Butte Mountain. Moon Valley 5 bedroom homes for sale are a very popular home size. 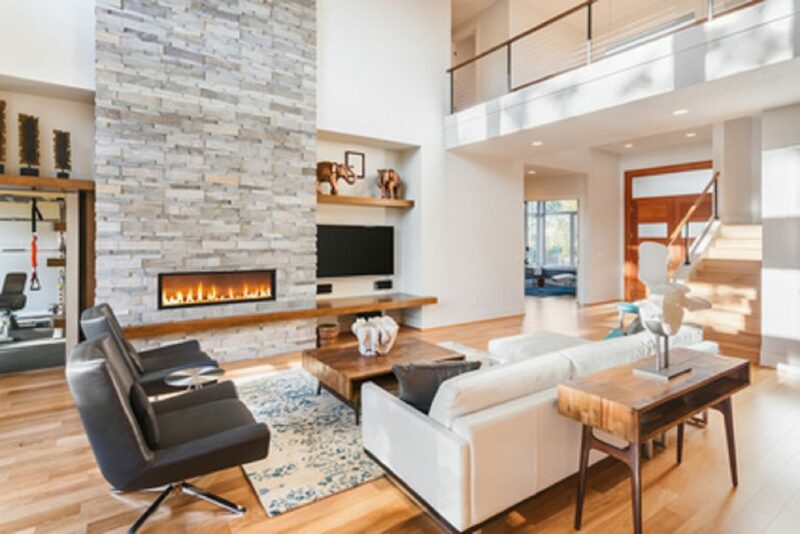 Many families have differing needs for larger homes such as growing families, they want a media room or home office or perhaps they need a guest area for frequent visitors. Take a look at Moon Valley 5 Bedroom Homes For Sale. For your convenience there is a link below to view all 5+ Bedroom Homes with Pools and without Pools. 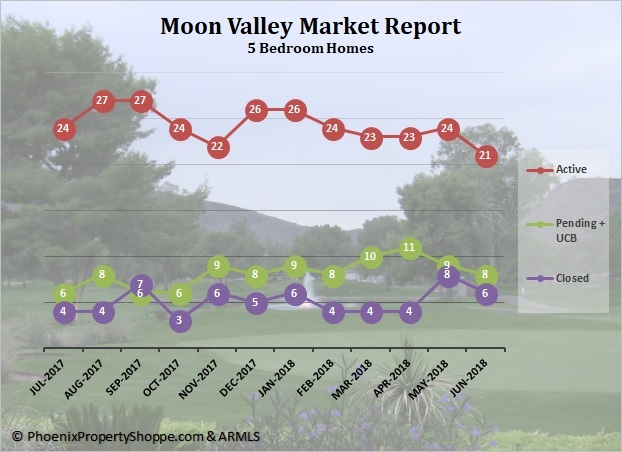 Knowing and understanding the current Moon Valley real estate market is essential to making an informed decision about buying or selling a home in the Moon Valley area. If you would like further information about your neighborhood let us know and we will email the current market statistics to you. Moon Valley 5 Bedroom Homes For Sale July 2018: There are currently 21 - 5+ bedroom homes for sale in Moon Valley, priced from a low of $302,000 to a high of $1,275,000. There are 8 more 5+ bedroom home under contract and 6 closed in June 2018. Thus far in 2018 there have been 32 five bedroom or larger homes sold, priced from a low of $314,000 to a high 0f $1,200,000 with an average price of $507,826. Average days on the market was 99. For these 32 homes, the sale price/list price ratio was 98%. With constant change in the inventory of 5 Bedroom Homes For Sale Moon Valley, if you would like to follow the market, let us help. We'll set up an on going search especially for you, with your own customized web site. You'll be notified as soon as new listings are posted. And when there is a home you would like to see, please let us know – we’ll set up a showing for you at your convenience. Are you Relocating to the Phoenix Area? Buying a Phoenix home can be a smooth and stress-free process as well as enjoyable! If you are considering a move to Phoenix our 'Banana' Team would be honored to represent you as your Exclusive Buyers Agent. 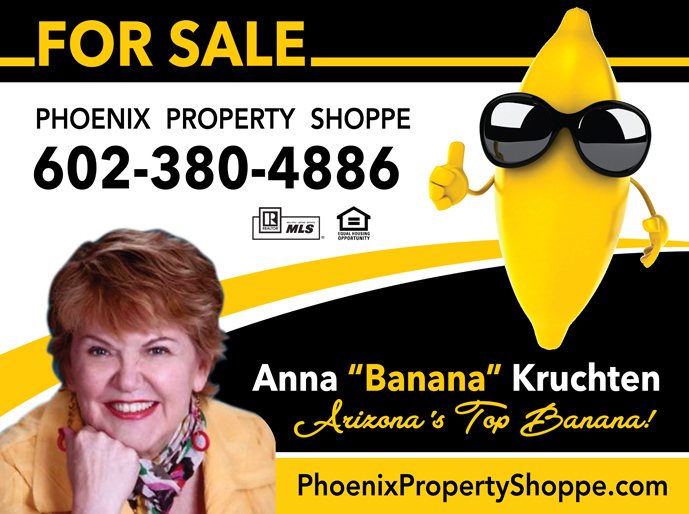 Anna 'Banana' Kruchten is the Owner and Broker of the Phoenix Property Shoppe and is among the top 3% of CRS REALTORS nationwide. Her knowledge, experience and integrity will skillfully guide you through the buying process. Give us call today! We Know, Love and Live in Moon Valley!